To change the Output folder location and structure, you need to add some properties to the CSPROJ file of your CSHTML5 application. Read below the meaning of each property. WARNING: The content of the "app", "libs", and "res" subfolders of the "Output" folder is deleted at each rebuild. To avoid data loss, make sure to only specify locations that do not contain other files! 4. 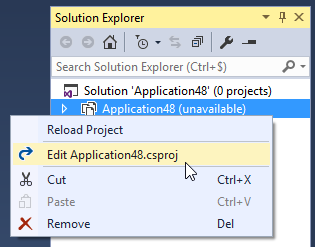 When you have finished editing the CSPROJ, reload the project. 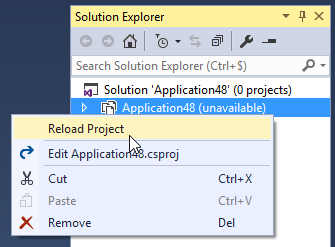 To do so, right-click on the project in the Solution Explorer, and click Reload Project. This property lets you specify the location of the Output folder. 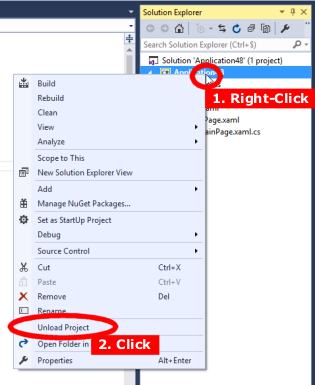 Note: Entering an absolute path is useful for example if you want to host your application in an ASP.NET project, and you want the Output files to be automatically created inside that ASP.NET project. These properties let you specify the path of the "app", "libs", and "res" folders, relative to the Output folder. 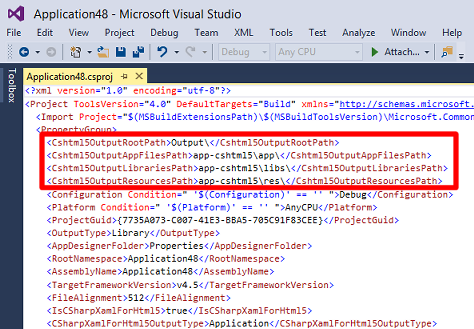 IMPORTANT: The paths must be relative to the Output folder. If one of the locations is ". ", the whole "Output" folder will be deleted at each rebuild.